Free Shipping Included! 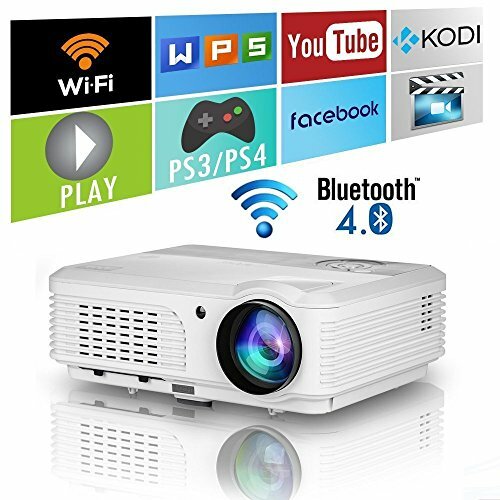 Wireless Bluetooth HD Projector 3200 Lumen Android 4.4 LCD Image System Home Theatre Projectors Support 1080p HDMI Airplay Screen Mirroring Multimedia LED Lamp 50,000hrs for Outdoor/Indoor Movie by EUG at The Square SC. MPN: USX660S+AB. Hurry! Limited time offer. Offer valid only while supplies last. 【Wi-Fi & Bluetooth Connectivity】The latest Wireless Screen Mirroring technology let you enjoy big projections from ios/ android/ windows devices directly, wireless streaming, no cables needed. Bluetooth4.0 capability can quickly pair with your Bluetooth speakers for better sound effects, and Bluetooth/ Wireless Mouse and Keyboard for easier operation. 【Cool Android4.4.4 & Apps】Built-in Android operating system, more mature and stable than android 6.0, powerful Quad-core processor with 8GB large storage, you can surf the internet, stream movies, tv, games and get access to a wide variety of online contents smoothly, no lag, no buffering. Pre-installed web browser, google, youtube, kodi and more, add massive apps from app store as you like. 【Outstanding Performance】The latest LED lighting technology boasts up to 3200 Lumens, WXGA 1280x800 native resolution, support 1080p/i, 720p. Accurate 16.7 million Full Color, Contrast 4200:1, enjoy the great visual feast. TFT LCD display, no "screen door" effect and no "Rainbow effect"(which exists in dlp projectors), Built-in dual surround sound speakers, ideal for home theater and gaming. 【Top-level Projection】From 50" to 200" Image Size, Throw distance:6.56-16.4FT, aspect ratio: 16:9 and 4:3, directly project onto a white wall, turn any place into an immersive theater. Front Table, Front Ceiling, Rear Ceiling, Rear Table Projection, support image flip function, unique zoom in and out, ±15°vertical keystone correction and Len focus, adjust the image easily, no picture distortion.